Are you ready to paint your face Seahawks blue and then stuff it with game day goodies? Yeah, sure, you could go out and hit the bar to watch the home team play the Atlanta Falcons, but the fleet-footed Russell Wilson and his crew are going to be up and at 'em Sunday MORNING (game starts at 10:00 a.m. PT), so how about a DIY brunch viewing party instead? Let’s call it a pre-funk, over easy. Or sofa-gating. 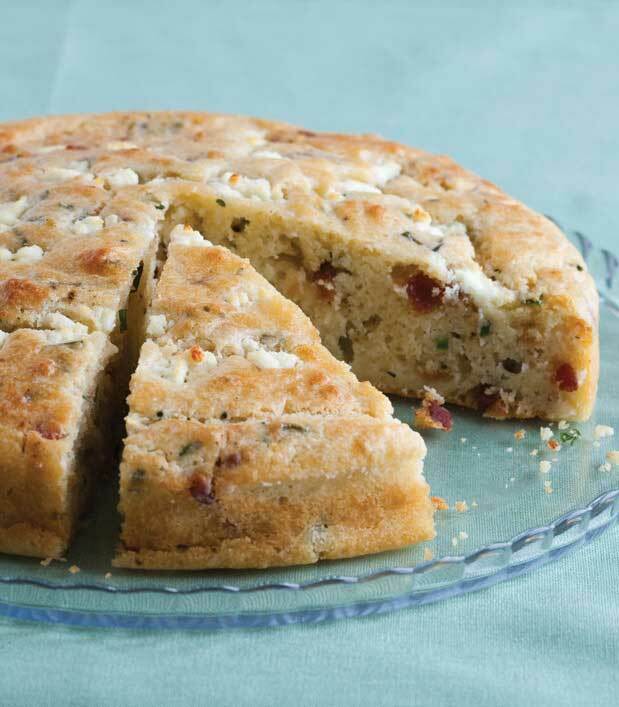 And what better way to get fired up about the big game than a batch of Bacon Bread from awesome Salty Snacks author Cynthia Nims? This crowd-pleaser is kind of like a scone, moist and easy to eat, leaving one hand free for high-fiving and fist-bumping. And did we mention? It stars BACON! It’s certainly a heckuva a lot more interesting than messy nachos. And it’s a perfect match for a Bloody Mary. So, bake a batch, invite your fellow 12th Man over and GO 'Hawks! Heat a large skillet over medium heat. Add the bacon slices and cook, turning the slices over every couple of minutes, until nicely browned and crisp, 8 to 10 minutes. Transfer the bacon to paper towels to drain and cool. When cooled, crumble or cut the bacon into small pieces; set aside. Preheat the oven to 350 F. Butter and flour an 8- or 9-inch round cake pan. Combine the flour, baking powder, baking soda, salt, and pepper in a medium bowl and stir well to mix. Combine 1 1/4 cups of the goat cheese and the butter in the bowl of a stand mixer fitted with the paddle attachment and beat at medium speed until smooth. Add one of the eggs and beat until fully incorporated, then beat in the second egg, scraping down the sides of the bowl as needed. Gradually add the dry ingredients with the mixer at low speed, alternating with the milk. Take the bowl from the stand and stir in the bacon and chives by hand, just until incorporated. Spoon the batter into the prepared pan, smoothing the top. Sprinkle the remaining 1/4 cup of goat cheese over the top. Bake until the top is lightly browned and the bread pulls away from the sides of the pan, 35 to 40 minutes. Let cool slightly in the pan, then turn the bread out onto the rack to cool completely, inverting the bread so that the goat cheese topping is upright. Cut the cooled bread into 12 to 16 wedges, arrange on a platter or large plate, and serve. The bread will keep for 1 day, well wrapped in foil. 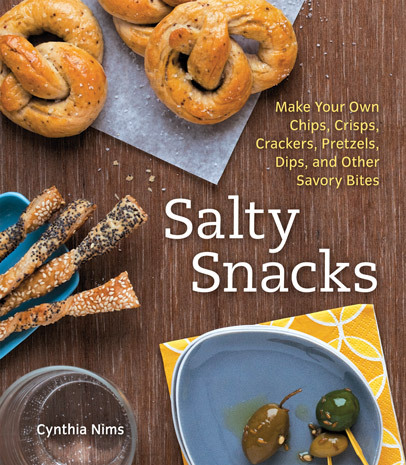 Reprinted with permission from Salty Snacks: Make Your Own Chips, Crisps, Crackers, Pretzels, Dips, and Other Savory Bites by Cynthia Nims, copyright © 2012. Published by Ten Speed Press, an imprint of the Crown Publishing Group.